The Proposed Support for Logical Model Integration document outlines all the areas that are targeted to be addressed in 3.2 related to logical model integration support in Eclipse. The purpose of this document is to outline the proposed solutions relating to Team. Feedback is strongly encouraged and may be provided on the platform-team-dev mailing list or in the bug 37723 for this plan item. The API described in this document is available in builds but is not yet final and may undergo some revision before the end of the Eclipse 3.2 development cycle. Team Operation Scope: API for translating a set of selected model elements into the complete set of model elements that should be included in a team operation. Model-based Merging: API for delegating a merge operation (e.g. cvs update or merge) to a model so that model semantics can be used to ensure model consistency and improve conflict resolution during merge operations. File History: API for describing the history of a file. It also contains a pointer to a download that contains a simple Library example. The relationship between the APIs presented in this document can be described in terms of a repository operation being performed on a logical model. Some of the API relates to any repository operation while other parts are specific to a merge operation (e.g. a CVS update). Here is a description of the steps required to perform a CVS update on a logical model as it relates to the API contained in this document. The user selects a set of model elements and chooses Team>Update from the context menu. The ResourceMapping API is what makes it possible for repository tooling to recognize that the selected elements are related to file-system resources in some way. The selected elements may be part of a higher level model or may only represent part of the contents of a file. The team operation needs to know the complete set of model elements and resources that need to be operated on. The Team Operation Scope API provides a set of reusable classes that determine the complete input (which we refer to as the scope) of the team operation. Once the complete scope of the operation is determined (i.e. the complete set of resources to be operated on), the operation can be performed. For a merge, the semantics of the model may dictate in what order files need to be merged or may be able to reduce the chances of conflicts by using model semantics to perform the merge. The Model-based Merging API allows the team operation to delegate the merge to the model. The following sections describe each of these API pieces in more detail. This solution involves adding API to the Resources plugin that maps logical models elements to workspace (i.e. file system) resources. The API is purposely simple with logical model manipulations omitted. A client can't use this interface to display logical models or gain any interesting additional knowledge about it. It's purpose is simply to map one or more model elements to workspace resources. There are two types of plugins that should be interested in resource mappings. Those who provide a model that consists of, or is persisted in, resources in the workspace and those that want to perform operations on resources. The following two sections describe how to associate a resource mapping with a model object and how to contribute menus to objects that adapt to resource mappings. Plugins that adapted their model objects to IResource in order to get resource specific actions shown in the context menu can now adapt to ResourceMapping if a richer description of how the object adapts to resources is beneficial. However, they are not required to do so if there is no benefit. For instance a Java compilation unit (i.e. *.java file shown in a JDT view) that now currently adapts to IFile need not adapt to ResourceMapping since nothing is gained. However, a Java package should adapt to ResourceMapping in order to indicate that the package consists of only the files in the corresponding folder and not the subfolders. The preferred way to adapt model elements to a resource mapping is to use an adapter factory. The following is the XML markup for contributing an adapter factory in a plugin manifest. The above is the preferable approach. However, the model object can implement the IAdaptable interface and provide a getAdapter(Class) implementation that creates returns an instance of ResourceMapping explicitly when asked for one. This is a more straightforward approach but the least desirable as the model must have explicit knowledge of the adaptation to resources. In some cases, the provider of a logical model may not want their model to adapt to IResource in every context or may want the object to adapt differently for object contributions than for other contexts. The workbench UI provides a special intermediate adapter API, IContributorResourceAdapter, for this purpose. When objects are being adapted to IResource in the context of object contributions, the workbench first tries to adapt the resource to IContributorResourceAdapter before trying to adapt to IResource directly. A new sub-interface of this interface, IContributorResourceAdapter2, has been added which provides the same capability for ResourceMapping. The only difference is that the model provider should register a factory for IContributorResourceAdapter since the Workbench does an instanceof check to see if the contributed adapter is also an instance of IContributorResourceAdapter2. The implementation of the ResourceMapping subclass for a Java package would look something like this. This is a fairly straightforward mapping so the implementation is not complex. The complexity of the resource mapping implementation will, of course, vary from model to model. The EObjectResourceMapping example used above is implemented in the example and has a more complicated implementation. Update their plugin.xml files to change the objectClass of their adaptable contributions to ResourceMapping (for those for which this is appropriate). Contributions to ResourceMapping will automatically apply to objects that adapt to IResource. This transitive association is handled by the Workbench. Filtering of the contributions to resource mappings can be done using action filters or expressions. An expression for filtering by project persistent property has been added to allow repository providers to have their menus appear on projects that are mapped to their repositories. One of the advantages of a Resource Mapping API is that it allows plug-ins to implement any operations they desire in terms of resource mappings (e.g. CVS update, CVS commit, CVS tag, dirty decoration, etc.). However, the API that has been introduced so far deals only with the local state of the model. When working with a model that may be shared between developers, you end up in a situation where the remote state of the model (i.e. the state of the model that another user has checked-in to the repository) may differ from the state in the workspace. If you performed a CVS update, you would want the local state of the model to match the remote state even if it meant that additional files needed to be included or some files needed to be removed. This is not an issue for some logical models. For instance, a java package is a container visited to a depth of one, regardless of the remote state of the model. Given this, a repository provider can easily determine that outgoing deletions should be included when committing or that incoming additions should be included when updating. However, the resources that constitute some logical models may change over time. For instance, the resources that constitute a model element may depend of the contents of a manifest file (or some other similar mechanism). In order for the resource mapping to return the proper traversal, it must access the remote contents of the manifest file (if it differs from the local contents) in order to see if there are additional resources that need to be included. These additional resources may not exist in the workspace but the repository provider would know how to make sure they did when the selected action was performed. When does a ResourceMapping need to worry about the RemoteResourceMappingContext? A ResourceMapping need only worry about a context supplied to the getTraversals method in cases were the resources that make up a model change over time and the relationship between the model and resources cannot be described by a simple traversal that is guaranteed to encompass those resources (and only those resources) that constitute the model. For example, although the resources of a Java package may change over time, the package can be described as a folder of depth of one so a resource mapping for java packages would not ned to make use of the resource mapping context. Notice that there are two sets of resources included in the model: those derived from the local contents of the HTML file in the workspace and those obtained from the contents of the remote file and base file. In either of these two sets, there may be resources that do not exist in the workspace. For instance, the local HTML file may contain a relative link to an image that does not exist in the workspace. This resource should be included so that it will be fetched if it exists remotely. As for the remote file, it may contain a new copy that references additional images that should be fetched when the new remote contents are downloaded. When does a repository need to provide a RemoteResourceMappingContext? The answer to the first question above depends on the type of operation that is being performed. Typically, updates and merges are three-way while comparisons and replace operations are two-way. The Eclipse Team API includes a Subscriber class that defines an API for providing the synchronization state between the local workspace and a remote server. A SubscriberResourceMappingContext has been created that uses a Subscriber to access the necessary remote state. Clients that have a Subscriber do not need to do any additional work to get a resource mapping context. From a model provider, clients can then obtain additional API pieces for performing operations on a set of resource mappings. Given a set of file-system resources, clients can query whether a model provider has model elements persisted in those resources and, if it does, obtain the set of resource mappings that describe the relationship. The following is an example of a modelProvider extension definition. The LibraryModelProvider is a subclass of ModelProvider. The enablement rule is used to match resources that the Library model persists its model in. In the above example, the model provider will match any resource in a project that has the library nature. Once the model provider is defined, the ResourceMapping#getModelProviderId() method should be overridden to return the id of the model provider. To get the proper inverse mapping of resources to resource mapping for those resources that match your provider's enablement rule, you should also override one or both of the getMapping methods. The method that you need to override depends on whether your model has elements that contain multiple resources or not. If your model elements map to a single resource, you can override the method that accepts a singleIResource argument. Otherwise, you will need to override the method that accepts an array of resources. Here's an example using the single resource case. The following example method wraps a library model file in an appropriate resource mapping. It also wraps folders that contain files that are of interest to the model provider. Clients can then access the model provider to determine whether the model providers cares about the resources that are about to be operated on. The next section describes API that will be provided to team operations that use the model provider API to determine the complete set of resource mappings to be operated on when a team operation is performed on a set of selected resources or model elements. IResourceMappingScope: Interface that defines the API for accessing the scope of the operation. It provides access to all the resource mappings being operated on and the traversals for those mappings as they were calculated during the scope building process. ScopeGenerator: Class that is used to build a scope given a set of input mappings and a resource mapping context. Team operations will provide the set of selected resource mappings and a resource mapping context. They will then call buildScope which calculates all the resource mappings that need to be included in the operation. The scope also caches the results so they do not need to be recalculated during the operation. You can get all the traversals or only those for a particular mapping. This section offers a brief explanation of what model based merging involves and provides pointers to example implementations in the SDK. The team provider needs to calculate the synchronization state of all the resources involved in the merge. This is done by subclassing ResourceMappingMergeOperation and overriding the buildContext method to return an IMergeContext. The merge context provides the model access to the synchronization state of the files involved (see the getSyncInfoTree() method) along with access to the contents of the files (see SyncInfo#getRemote() and SyncInfo#getBase()). The CVS UI plugin contains an a merge operation subclass named CVSMappingMergeOperation. The model needs to adapt it's model provider to an instance of IResourceMappingMerger. The merge operation delegates the merge to the registered merger. The platform has a default implementation, DefaultResourceMappingMerger, that performs a text-based merge on the files using the IStreamMerger registered for that file type. ISynchronzationContext: provides access to the synchronization stat of all resources within the scope of the operation. The following API pieces are used to describe the synchronization state of resources. IDiffTree/IResourceDiffTree: data structure that contains the synchronization state for all resources in the operation scope that are out-of-sync. IResourceVariant: provides access to the base or remote file stat and contents that were used to determine the synchronization state for a local resource. IMergeContext: a synchronization context with additional methods that support merging. API has been added in M4 that allows models to provide a team-aware content provider that can be used by Team providers to display the effetcs of team operation in termes of model elements and hierarchies. 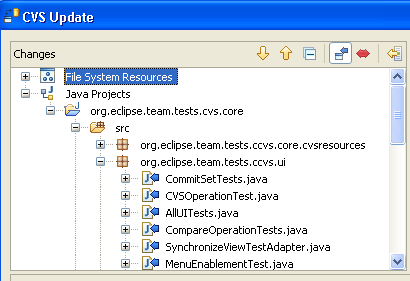 The CVS Team>Update context menu action in Eclipse 3.2 Milestone 4 (M4) can be configured to display logical model elements and hierarchies when previewing the effects of an update. You must turn on the "Perform client side merges on update" preference on the Team>CVS>Work In Progress preference page. In M4, Java implements a team-aware content provider which allows the effects of an update to be shown with respect to the Java model. Create a extension to the org.eclipse.ui.navigator.navigatorContent extension point. Minimally, you will need to provide a content provider and label provider and an enablement rule that matches the appropriate model elements. The enablement sule should also match both IResourceMappingScope and ISynchronizationContext as either of these could be used as the input object to a Team viewer. Associate your navigatorContent extension with the Team viewer using the org.eclipse.ui.navigator.viewer extension point. The Team viewer id is org.eclipse.team.ui.navigatorViewer. Bind your content extension to your model provider using the org.eclipse.team.ui.teamContentProviders extenson point. The following xml shows how the Java content provider is made team-aware. The JavaSynchronizationContentProvider and JavaSynchronizationLabelProvider classes in the above example are subclasses of SynchronizationContentProvider and SynchronizationLabelProvider and make use of the synchronization context to provide filtering and label decoration. IFileRevision: The description of a single revision or state of a file at a particular poin tin time in its history. Along with this API, a generic file history view is being proposed. A preview version is available in M4. This example, available here, is built on a model that consists of libraries, books and writers. See the Eclipse Team/CVS 3.2 plan for what is happening in M5 and beyond. This document contains a description of the API available so far in 3.2. This is only a portion of the feature set described in the Proposed Support for Logical Model Integration document. Additional API for Team support of logical model integration will be added to the document as it becomes available. Also, the API described in this document may still undergo change in the 3.2 release cycle. The document will be updated with any changes as well. Updated 3.1 Resource Mapping document to reflect new support available in 3.2 M3.